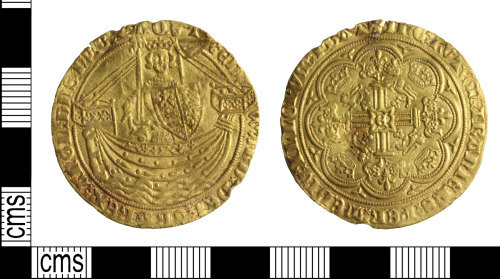 A complete gold noble of Edward III (AD 1327 to AD 1377), dating to the period AD 1363 to AD 1369. Treaty series. Mint: London. North 1231. Reverse description: Triple stranded cross with crowns and lis in angles. E in centre. A complete gold quarter noble of Edward III (AD 1327-1377), Treaty Series dating to AD 1363-1369. Mint of London. North 1243. Gold quarter noble of Edward III (1327-1377), Treaty Series (1363-1369), minted in London, North 1244.